Complete dry pet food for dogs aged 2 months+. 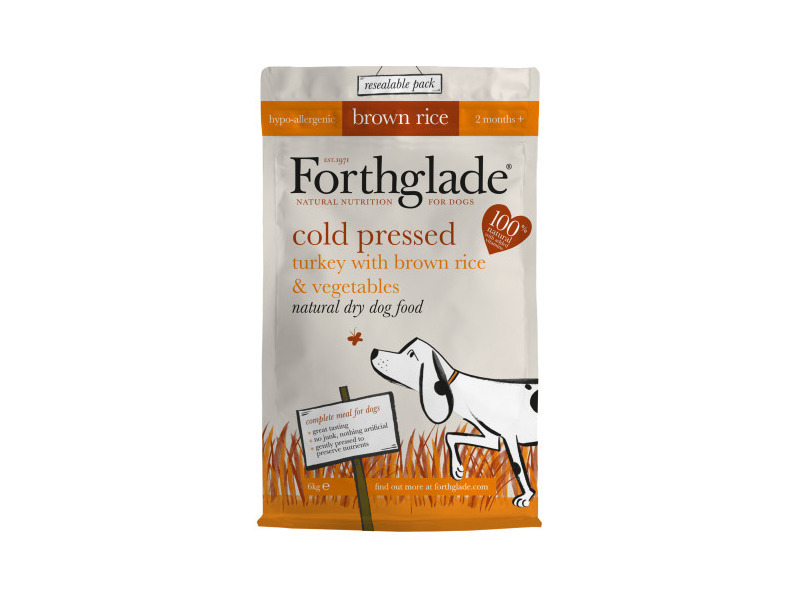 A nutritionally complete food that can be fed on its own or mixed with a good quality, natural wet dog food. If mixing with other foods please adjust quantities accordingly. Dried Ground Duck (30%), Brown Rice (22%), Sweet Potato (5%), Dried Ground Whitefish (5%), Dried Vegetables (5% Carrots, Chicory, Parsley Root, Parsnip), Dried Ground Liver (5%), Beet Pulp , Minerals, Salmon Oil, Cold Pressed Rapeseed Oil, Cold Pressed Linseed Oil, Gelatin, Dried Moor, Dried Herbs (3% Horsetail, Walnut Leaves, Fennel, Nettle, Dandelion), Dried Seaweed, Dried Fruits (2.5% Apple, Pear, Blueberry), Prebiotic MOS (Mannan-Oligosaccharide), Camomile, Yucca Extract. Crude Protein 25%, Crude Fibres 4.6%, Crude Oils & Fats 10%, Crude Ash 7.3%, Calcium 1.3%, Phosphorus 1.0%. Dried Ground Chicken (30%), Brown Rice (22%), Sweet Potato (5%), Dried Ground Whitefish (5%), Dried Vegetables (5% Carrots, Chicory, Parsley Root, Parsnip), Dried Ground Liver (5%), Beet Pulp , Minerals, Salmon Oil, Cold Pressed Rapeseed Oil, Cold Pressed Linseed Oil, Gelatin, Dried Moor, Dried Herbs (3% Horsetail, Walnut Leaves, Fennel, Nettle, Dandelion), Dried Seaweed, Dried Fruits (2.5% Apple, Pear, Blueberry), Prebiotic MOS (Mannan-Oligosaccharide), Camomile, Yucca Extract. Crude Protein 25%, Crude Fibres 5.0%, Crude Oils & Fats 10%, Crude Ash 7.3%, Calcium 1.3%, Phosphorus 1.0%. Storage: keep in a container that allows the food to breathe. A cool, dry place is best. Make sure fresh drinking water is always available. Below are some recent questions we've received regarding Forthglade Cold Pressed Dog Food, including answers from our team. 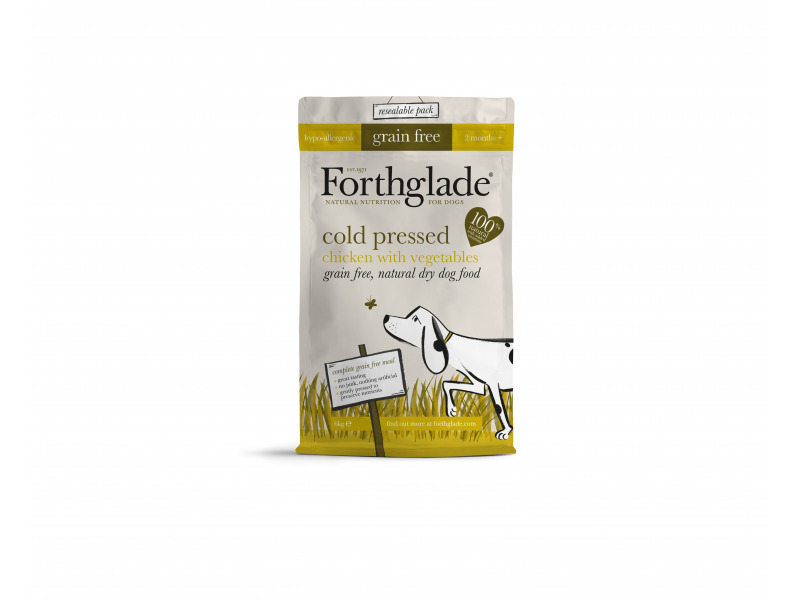 Forthglade Cold Pressed natural dry food is cold pressed at a low temperature to retain the goodness of the natural ingredients, and so the product's appearance is different to the dry food we are all used to seeing. Although the bite-sized chunks look quite hard from the outside, they are much softer than your average dry food – if you snap one of the pieces you’ll find that it breaks easily. If you’re worried about the individual pieces being large for your dog, you can always add a little warm water to soften them up (this is particularly good for puppies and small dogs).